Local historians seem to be deeply divided when it comes who is honoured by the name of William Street, off O’Connell Street in Limerick. Other local historians say the street was named after a King William. But William III (1689-1702) reigned long before the Georgian development of Limerick, and as William of Orange whose forces were victorious at the Siege of Limerick in 1690, would have been too unpopular to give his name to a Limerick street in the century that followed. On the other hand, the historian Maurice Lenihan (1811-1895), in The History of Limerick (1864) says William Street was named in 1787, which is half a century before the reign of William IV (1830-1837). 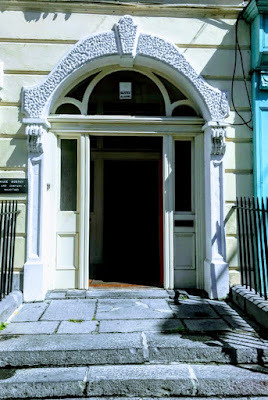 Most historians agree that this William Pery who gave his name to William Street is William Cecil Pery (1721-1794), Bishop of Limerick (1772-1784) and 1st Baron Glentworth. He was a brother of Edmund Sexton Pery (1719-1806), 1st Viscount Pery, who began the Georgian development at Newtown Pery in Limerick. Bishop William Pery was the ancestor of the Earls of Limerick, and at least three people in his family with the name William Pery were successive Earls of Limerick: William Henry Tennison Pery (1812-1866), 2nd Earl of Limerick, William Hale John Charles Pery (1840-1896), 3rd Earl of Limerick, and William Henry Edmund de Vere Sheaffe Pery (1863-1929), 4th Earl of Limerick. Today, William Street is one of the busiest shopping streets in Limerick city centre, with wide footpaths and many modern shops. But it is still possible to pick out many of the once elegant Georgian townhouses on William Street. 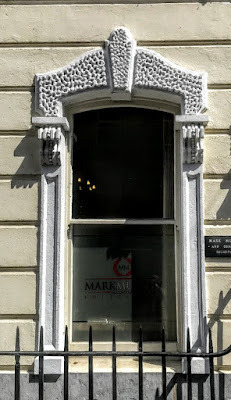 The most eye-catching of these, for me, is No 16, now the offices of Mark Murphy & Co, solicitors. This terraced, two-bay, four-storey over basement townhouse, was built around 1810, when this part of Georgian Limerick was being developed. It was once part of an hotel and has a railed front site basement area. But the house stands out today because of its richly decorative stucco façade, which dates from around 1860. The round-arched door opening has an elaborate stucco surround that has panelled pilasters with console brackets supporting elaborate vermiculated stucco over the front door; a timber-framed fanlight with round-arched glazing bars; and a tripartite timber doorframe with sidelights over the panelled timber bases flanking a flat-panelled timber door. This opens onto a limestone front door platform that bridges the front site basement area, which is enclosed by a limestone plinth wall supporting wrought-iron railings with cast-iron rail posts that have pineapple finials. 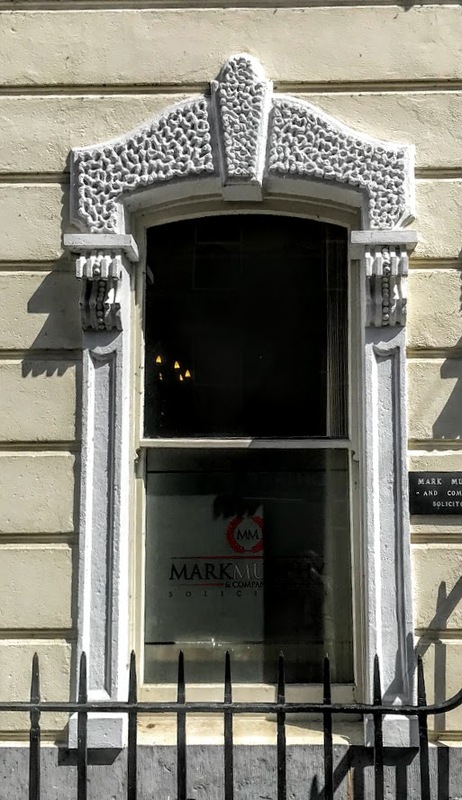 At the ground floor level, there are two camber-arched window openings with panelled uprights and console brackets standing on painted sills and with supporting elaborate vermiculated stucco window heads. There are painted rendered walls with a channel rusticated ground floor level, and a moulded stringcourse delineating the ground and first floor sill level. There are distinctive soldier quoins at the party walls. The square-headed window openings above the ground-floor level have elaborate stucco lugged architraves, painted sills, and cast-iron sill guards at first-floor level. Above, there are acroteria or architectural decorations on the enriched parapet entablature, and the parapet wall hides the pitched roof. There is a large brick chimney-stack at the west party wall. Sadly, the original windows have been lost, and there are replacement uPVC windows throughout the building. The house has a red-brick rear elevation with cement rendering. I understand there are square-headed openings, with tripartite timber sash windows that have timber mullion piers. This is an attractive terraced house that received a late 19th-century stucco makeover to form the current street-fronting façade elevation. 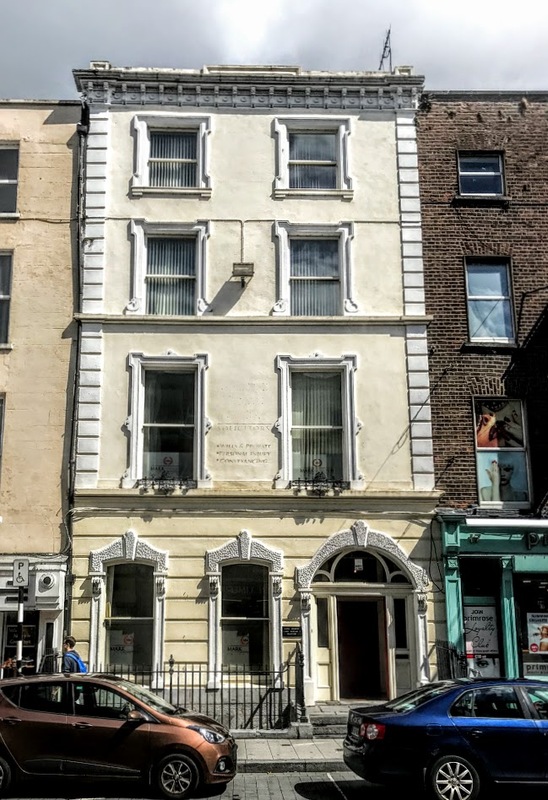 But it would be so easy to pass this enriched façade with its stucco decoration and its distinctive expressions of architectural individuality.